Five years after his remarkable feature debut, Here Is Your Life (1966), Jan Troell made the hugely ambitious film which gave him an international reputation. 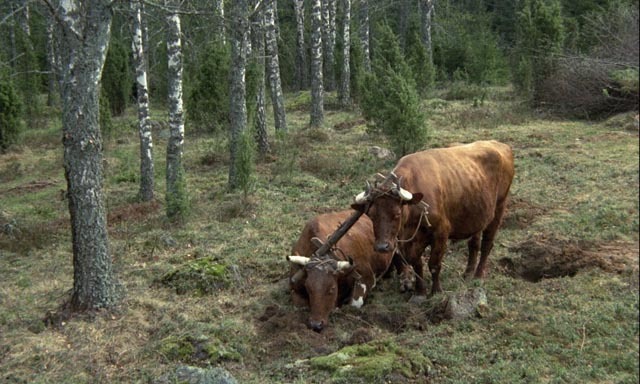 Adapted from four novels by Vilhelm Moberg, The Emigrants (1971) and its companion The New Land (1972) actually comprise a single film detailing the lives and hardships of a poor Swedish family who leave their home in the mid-19th Century and head for a hopefully better life in North America. Spanning almost two decades, two continents and the ocean in between, this 394-minute epic is remarkable for a number of reasons, not least in that Troell approached it creatively in the same way as his earlier feature. Not only did he co-write (once again with Bengt Forslund) and direct; he also photographed and edited the film, something normally unheard of on a project of this scale. But handling his own camera was crucial to the film’s tone, moods and rhythms. Troell was free to respond moment by moment to what was happening on and around the set, shifting focus in ways which added a documentary-like feel to events, giving the impression of capturing life as it happened rather than merely recording something being staged in a predetermined way. It also made room for his sensitivity to the natural world in which the characters live. This kind of spontaneity gives his work an immediacy rare in film, and even more rare in a period setting. As in Here Is Your Life, we feel immersed in a living world, caught up in the flow of life in such a way that Troell can compress and elide events while giving us a clear view of everything essential. This is true too of his interaction with the film’s actors, who seem liberated in a way which allows them to inhabit their characters with an easy naturalism. The cast is superb and even such well-known figures as Max Von Sydow and Liv Ullman disappear into their roles; we gain access to every emotional subtlety of one of the most authentic portraits of a marriage ever caught on film, a loving relationship which survives through many harsh trials. Apart from practical considerations concerning the length of the film, there are structural and thematic reasons for splitting it into two parts. First there are the two very different lands depicted: a harsh, stratified Sweden where life is defined and constrained by very old traditions, and a vast, unformed United States where it seems possible to remake a life in new ways. But it’s not entirely that simple. In Sweden, there is also a sense of community (for good and ill) which gives shape to existence, while the apparently endless potential of the wilds of Minnesota can seem to cast the characters adrift. This is, of course, the essential characteristic of the emigrant experience, the vertigo of disconnection from the old and the fear and exhilaration of the new. Perhaps the most surprising aspect of Troell’s film is that it avoids mythologizing the States as Hollywood so often tends to do. In The Emigrants, we get an intense depiction of the hardship of these peasant farmers trying to scrape out a living on inhospitable land; we understand completely what drives them to undertake the dangerous journey to escape poverty and a repressive, church-bound community. That journey, which occupies almost the last two-thirds of the first part, is captured in all its horrific detail; the appalling conditions on board the ship, leading to sickness and death among the emigrants; the almost hallucinatory arrival in the States, where these people we’ve come to know intimately suddenly appear as strangers, outsiders; and then the long journey inland by train and riverboat, creating new stresses among the group. But we also begin to see the stripping away of preconceptions and prejudices which they’ve been carrying with them as part of their baggage. By the time the group reaches Minnesota, social lines have been redrawn; this new land does indeed inspire an opening of minds and a freeing of emotions. 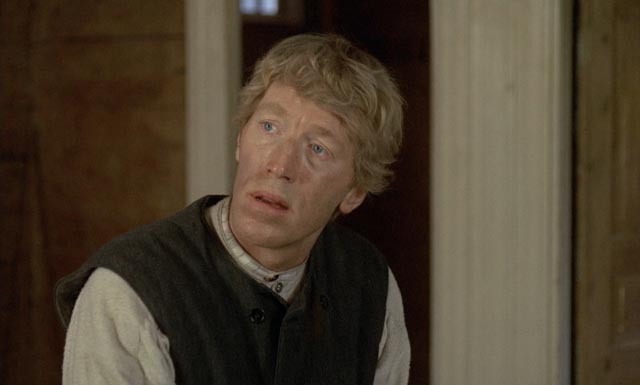 The first part of the film ends on a note of great hope as Karl Oskar (Von Sydow) stands and surveys the pristine wilderness where he will plant new roots, build his farm and raise his family. The second part, The New Land, opens with the beginnings of this work and, as it progresses, it becomes clear that life here will be just as back-breakingly hard as it was back home – although at least the soil is fertile. Karl Oskar throws himself into the work because here he has to answer to no one; this is his land. He stands as the American individualist, in contrast to the constrained member of the community he was back home. But Kristina (Ullman) feels the lack of that community and suffers from homesickness. This new world lacks stability and threats lurk just beyond the hearth. And yet, when they are visited by representatives of their old church community who have followed the emigrants in order to reassert proper moral control, it is Kristina who turfs them out. She too is no longer willing to have her choices constrained by the self-righteous guardians of decency. The biggest difference between the film’s two parts is the way The New Land discards a tight sense of narrative control, becoming looser and more discursive. Everything in The Emigrants is focused on depicting the brutal hardship of their lives and the decisions they make to escape. With the unformed opportunities afforded by the new land, the film becomes more episodic, covering more time and drawing in larger historical forces. While Karl Oskar builds his new homestead, his younger brother Robert (Eddie Axberg, star of Here Is Your Life) heads out with his friend Arvid (Pierre Lindstedt) to seek a fortune in the gold fields of California. After their departure, the film glides through changing seasons, gives us glimpses of the native Americans who had prior claim to this land and now seem strangers and outsiders because we see them from the newcomers’ point of view. The farm grows bigger, Kristina has yet more children, other emigrants arrive and settle on the land around them. When Robert returns after years away, Karl Oskar greets him with anger and contempt; Robert’s dreams of adventure and “easy” wealth stand in harsh contrast to his brother’s hard work and dedication to family. It is only after his return that we get to see just what that adventure has entailed, presented by Troell as a feverish phantasmagoria (perhaps suggested in part by the final sequence of Von Stroheim’s Greed ), in which Robert and Arvid become lost in the desert. These memories are the most stylistically radical aspect of the film, an intensely subjective evocation of the dark side of the emigrants’ dream of a new, unconstrained life. As it progresses, The New Land seems to become more fragmented. Karl Oskar and Kristina argue about his wanting to become involved in the Civil War – she firmly believes that any killing is against the law of God, while he feels that killing in war isn’t murder and that he has an obligation to his new country. But the point is ultimately moot because he’s rejected as unfit. Late in the film, Troell departs from Karl Oskar and Kristina’s story to deal with the 1862 Sioux Uprising, represented here by the killing of Kristina’s uncle Danjel (Allan Edwall) and his family, and the subsequent mass execution of thirty-eight warriors. This devastating sequence calls into question the great American myth of European settlers “opening” the west and casts a shadow over the accomplishments of Karl Oskar and his neighbours in establishing a more open community than the one they left behind in the old country. Troell remains non-judgemental but doesn’t shy away from this darker side. When another emigrant comments to Karl Oskar that they have stolen the Indians’ land, he angrily responds that he stole nothing, that he bought it legally from the government. The other man points out that this legality occurred only after the fact of the original theft, giving rise late in the story to the realization that in a way Karl Oskar himself has now attained the position of the oppressive landowners back in Sweden who had made the peasants’ lives so difficult. The cast is uniformly fine, from Von Sydow and Ullman doing some of the best work of their careers down to the youngest of the many children. Two performances in particular stand out for me: the jazz singer Monica Zetterlund who plays Ulrika, a fierce former prostitute who despises the hypocrisy of her “betters”, including Kristina, whose judgemental attitude, rooted in her religion, eventually shifts so that in the new land they become close friends; and Pierre Lindstedt, whose portrayal of the slow-witted Arvid nonetheless reveals a sensitive interior, his attachment to Robert leading him finally to a heartbreaking fate. 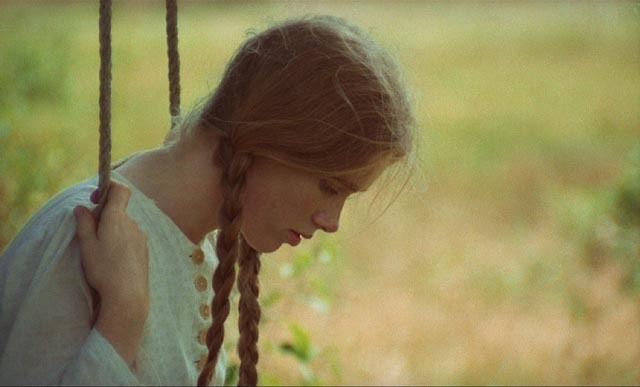 In The Emigrants and The New Land, Jan Troell manages the rare feat of creating an intimate epic, an expansive canvas which never loses sight of the rich details of its characters’ lives. As critic John Simon points out in his introduction to the films, Troell has the ability to depict the ordinary lives of working people without exaggeration or melodrama, every moment firmly grounded in reality. While the films remain aware of larger historical forces and the ways in which they shape individual experience, they manage to give us the impression of direct access to these people’s lives and infuse the historical narrative with an immediacy which is very rare in period movies. Criterion’s 2-disk Blu-ray edition presents both films in their full-length versions. When originally released in North America, they were both cut considerably shorter – a fact oddly not mentioned by Criterion, although referred to in passing by Troell in his interview on the second disk. The Emigrants was cut by about 40 minutes, while (if the numbers on IMDb are correct) The New Land lost 50% of its running time. Although Troell was shooting for the first time in colour, his photography is superb, the often hand-held camerawork greatly adding to the sense of intimacy and immediacy. The original mono sound is clear, making expressive use of natural sounds and a sparingly used score (by Erik Nordgren on The Emigrants and Bengt Ernryd on The New Land, with a distinctive use of percussion by Georg Oddner during the memory flashbacks to Robert’s experience in the desert). In addition to John Simon’s introduction on the first disk (7:27), in which he focuses on Troell’s ability to make the lives of ordinary people fascinating, there is a 2005 documentary about the making of the films, To Paint With Pictures (56:56), which provides an interesting account of Troell’s working methods and the sometimes prickly involvement of author Vilhelm Moberg. On the second disk, there is a conversation between critic Peter Cowie and Troell (35:43) which delves into the films’ background and the enormous undertaking of the lengthy production – at the time the most expensive project in the history of Swedish cinema. Troell comes across as a thoughtful and modest artist. Interestingly, although there was some location shooting in the States, all the homestead sequences were actually shot in Sweden. 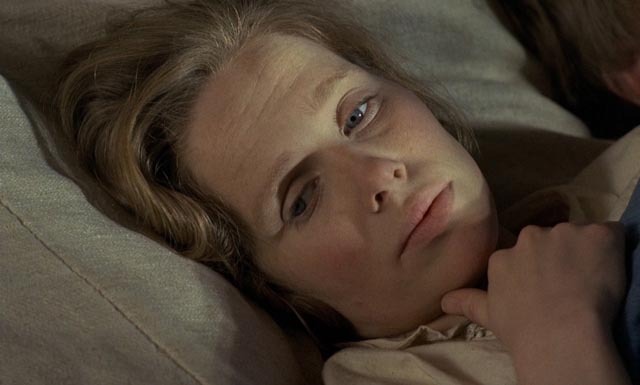 In addition, there is a 2015 interview with Liv Ullman (24:06), who expresses gratitude to Troell for the opportunity to play Kristina, the character, she says, that she identifies most closely with in her career. Although she speaks of working with Bergman, she says that working with Troell was the best experience she ever had as a film actress. Each disk includes a trailer, both of which play like lengthy excerpts – The Emigrants at 4:36 and The New Land at 4:05 – with the latter rather strangely opening with the execution of the Sioux warriors rather than focusing on Karl Oskar and Kristina’s experience. Critic Terrence Rafferty supplies the booklet essay. This entry was posted in Review and tagged Actors, Blu-Ray, Classics, Criterion, Directors, Historical Film, Literary Adaptation, Swedish Film. Bookmark the permalink.